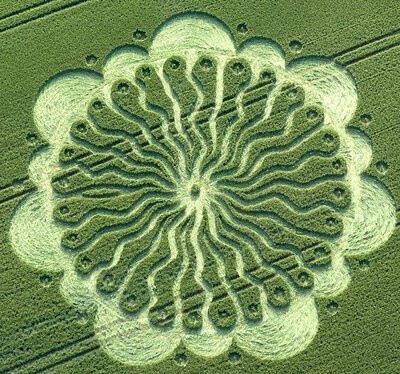 11:11:11 ~ Opening Of The Sacred Rose Stargate !! !! !! Yesterday,on the 1st of November we held the most wonderful gathering here in Buenos Aires, Argentina. From start to finish the energy was soft, loving and harmonious, but also strong and filled with the purpose of clear intentions from clear hearts! It was the most beautiful and loving energy of the Sacred Rose, supported and held by Mary Magdalene with her Twin Flame partner, Yeshua, and sponsored by Archangel Michael. After the morning work when we connected with the energies of Mary Magdalene and Yeshua, and Kwan Yin and the Buddha, we then asked Sarasvati and Shiva to support our creative work for the energy of the Sacred Rose in Buenos Aires. 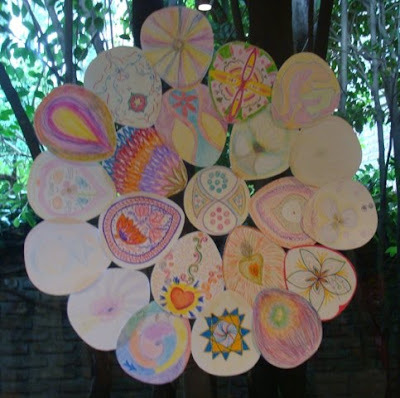 Our group created this lovely joint work of art.....a Sacred Rose Mandala based on the form of the Rose Window. 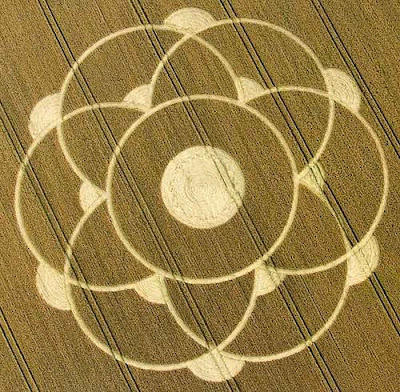 The Sacred Rose windows encoded in Light and Color the information of the Sacred Rose vortexes and stargates, and the Sacred Rose grid as defined in Sacred Geometry. This grid is held within the "Flower of Life", and Mary Magdalene calls it the "Flower of Love". The energy of the Rose, of the Magdalene and of the Divine Feminine in partnership with the Divine Masculine was the loving support that the group used to define this new energy for the City of Buenos Aires. The people who attended the event carried the deep purity of heart and soul that was the gift of the Diamond Light grid that was activated in April. The Diamond grid is also held within the Flower of Life! It was interesting to me that this work with the Sacred Rose energy was undertaken in the same venue where I did the Diamond Light activations in early May. The energy was ready to support the activation of the Sacred Rose energy and the Sacred Rose grid for the city of Buenos Aires. The purpose of this gathering and the work of this group was to assist in defining and holding the energy of the Sacred Rose for the 11:11:11 work on a Planetary scale. The creation of the Sacred Rose Mandala by the group was to specifically hold that energy as a seed for the city of Buenos Aires. I share with you here some of the images from this Light work. First the Mandala that holds the energy of each person in the group. Each "petal" was created by a person and together they created the Rose. This is symbolic of how the energy of individuals is combined to create the energy of the Group or the "One" that is the combination or merging of the creative soul energy into a creative project. It is a seed energy for the way in which the New Earth will be manifested and created by groups of people combining their soul energy and power to cocreate with Spirit. Beloved Lightworkers, you enter into a sacred moment as the Light intensifies. This is the moment when the Sacred Rose Stargate begins to open and you begin to align your Consciousness with the Cosmic Creation Matrix, in preparation for the final steps in your current Evolutionary Journey of Transformation. This 11:11 portal is especially powerful, for it is in effect an 11:11:11. 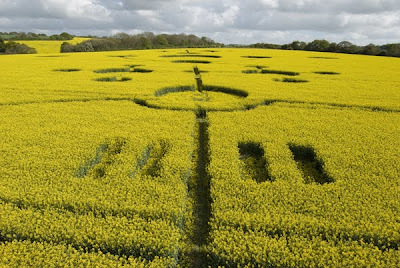 The triple energies represent an activation point for the energies of the Divine Christ Light. 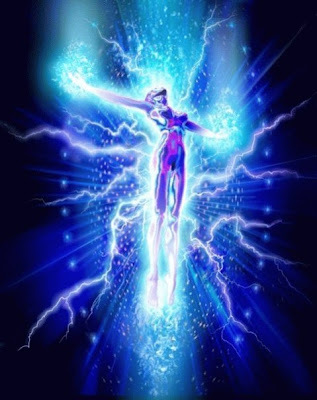 At this time, there will be an "explosion" of Radiance, and you will begin to activate the Rose Stargate or Portal that will be your connection point to the Cosmic Consciousness. Dearest Ones, in this last phase of your transformation, you have activated your original perfection blueprint in your DNA, balanced your inner masculine and feminine energies, and brought your Lightbody into full activation. You have activated the Pineal gland and begun the process of transforming the gland into its crystalline new energy form so that it can receive and transmit the higher frequencies of crystalline light. Now, you begin to unfurl the "petals" of the Rose within your energy field and to form or create the Auric "stargate" that will allow you to access the Cosmic Light of the "One" directly and as a Collective. 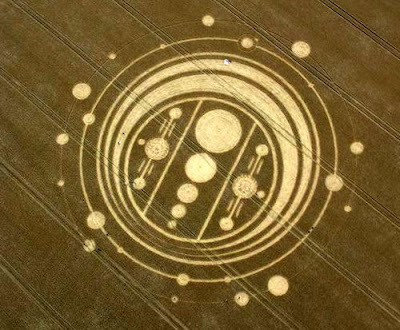 As you begin to formulate this coherent pattern of Beauty within your energy body, so the Planet also begins to create this stargate beginning over that region that you know as the southern pole. Beloved Ones, this is the culmination of the Mystery of the Sacred Rose and the Twin Flame, and the Activation of the Grail Codes. The Sacred Rose is the symbol of the Ascended Christ Consciousness, as it encodes a Sacred Truth about Who You Are and your Ascension process. Let us explain it this way. The Grail Codes of Light activate the potential within your physical being to carry the Golden Flame of the Christ Consciousness. This is also symbolized by the Golden Chalice. You, yourselves, in your enlightened physical body, are the "chalice" that holds the golden and infinite light of Spirit. The Sacred Symbol for the Ascended Christ teaching is the Rose within the Chalice. Beloved Ones, the Rose is your Light Body Spinal channel, culminating in the "Flower" of life, the Rose Stargate that connects you to your Divinity and the Divine Cosmic Consciousness of the Cosmic Creation Matrix. This Rose, or in the eastern tradition, the Lotus flower, opens to create a portal to Cosmic Consciousness, and it was known to the Ancients to be a part of the "design" of the "Divine Human" or Human Angel. Many of the ancient spiritual practices were designed to ascend power up the spinal channel of light and to open the "blossom" which was the Sacred Geometric Portal known as the Rose Stargate. This flower design was encoded into the great cathedrals of France, such as Notre Dame de Chatres, that honored the life and teachings of "Our Lady", the Feminine Christ Light of Mary Magdalene and her partner, Yeshua ben Josef. And so, Beloved Ones, the Sacred Rose of the Flower of Life is the Cosmic Stargate that you will begin to formulate and "unfurl" in your Soul Star energy field, as you and your Planet are rebirthed and restructured into the Great Cosmic Rose or Flower. This is the Geometry of the Stargate Harmonic that will facilitate your final ascension into the Cosmic Heart and Mind and the full Creation and Experience of the New Earth. Beloved Lightworkers, as you activate the Sacred Rose, you will indeed need to hold the highest vibration of Peace and Love. You are creating, within your Spiritual Body or spherical energy field, a Sacred Geometric design of the Highest Frequency available the Humans at this time. This pattern of Higher Coherence will need to be held in place by the physical energy of Coherence and Integrity, or the energies will become unbalanced and will collapse into chaos very easily. If this happens, dearest ones, do not panic or become anxious or depressed. Return to your Heart center, as we have taught you, and breathe deeply, connecting with the Golden Flame of the Christ Consciousness and the energy of Unconditional Love. Connect with the Sacred Heart energy within, balance your inner masculine and feminine energies through intention and enter into Sacred Union with your Soul and Spirit, as we have taught you. So, you will return to patterns of Coherence and Grace and Beauty and Integrity. For, you are the Sacred Rose, you are Beauty and Coherence and Grace and Passion. You are Divine Love enfolded into Human Form. At this time of 11:11:11, those of you who are ready will begin to create the Rose, or "unfurl" the "petals" of Light that will coalsce into the Rose Stargate of Cosmic Light and Consciousness. Beloved Flowers of Light and Love, you have reached a very Sacred Moment when you are ready to become the Sacred Rose. I ask you, now, to be with me and to allow the Radiant Christ energy to enter into your being and to allow you to open the Rose of Cosmic Consciousness. This was the work that I did with my Beloved, with the purpose of raising your consciousness to the point where you could truly embrace the Divine and Cosmic aspects of your Being. It is that point where you know within your heart and soul and body that You Are Heaven on Earth and that you are the Rose of the Christ Light. So, sit very quietly, and allow yourself to breathe very deeply. Focus into your beautiful and Sacred Heart and feel the Flow of the Divine Energy moving through you. You are Beautiful and you are Loved, so deeply Loved. Feel that Love moving through every cell in your body and every aspect of who you are in the Realms of Light. You are so deeply Loved. Breathe that Love. Feel it in your Heart. It is best if you breathe deeply through your nose and exhale through your mouth, letting the breathe of life move through your body. You are Loved. So, sit in this way and allow yourself to breathe for at least ten minutes. After this time, your body should be still and your mind clear. Now, focus into your Heart again and ask your Higher Self to align your inner Divine Masculine and Feminine energies. Feel the explosion of ecstatic radiance in your Heart moving down your body through your lower chakras and into the Earth, down to the Earth Star. You are grounded and your are connected to the Earth. Feel the Love flowing from your Heart to the Earth and back into your Heart. Breathe that Love into your Being. Now, as you bask gently in that Beautiful Love, feel the energy of Divine Grace all around you. You are held in Grace and Beauty, and you trust absolutely that you are being supported and guided by the Divine Light within. So, now, allow yourself to feel the channel in your Light Body that aligns with your spine, and allow yourself to pull that energy of Love up that channel, through the Heart channel and up into the Crown. At this point, you will feel the Pineal Gland activate in an explosion of Light and Love, and that Light will travel upwards, and the petals of the Rose will begin to open. It will be the most beautiful and ecstatic experience, if you are ready to receive the Divine Love that will pour through you and into your Heart and down into the Earth. And you will feel the Rose opening all around you. The colors will swirl around you and you will feel movement, as your Spirit Sphere restructures into the Sacred Geometric patterns of the Sacred Rose. Dearest Children of Light, know that you are Loved. Know that this beautiful Rose of Light will be the Spirit and Soul vehicle that will lift you into Cosmic Consciousness. We celebrate with you the opening of the Rose....the Flower of Love. Feel how this restructuring will open you to the Cosmic Creation Matrix, the Great Womb of all Creation. You will know, as I knew, your own Divine Essence and you will become One with the Divine Light of Creation. Beloved Children of Light, this was my work and my purpose with my Beloved. And we succeeded. For now, we are here to give to you these simple words that will begin to fire the completion sequence of the Grail Codes in those who are prepared to accept their own transformation and emergence into the New Earth way of Being. For us, this is a moment of Great Joy, as we see the completion of that which we came to do two thousand years ago. And we rejoice that not only our work finds completion, but the work of many others who have served the Divine Plan for your Evolution and Ascension into the Flower of Light that you Are. So, at the end of this meditation, know that the process has begun. Breathe deeply and allow yourself to return your focus to your Heart. Again, breathe deeply, and allow the focus of your awareness to enter into your body once again. Beloved Ones, know that as this Rose opens in your Spirit Sphere, you will feel and experience great change. You will feel safe, you will feel loved, you will feel Connected to Our Love, and you will know that All is Well, no matter what you must move through. You will feel Light at Heart and you will enjoy Life as you feel the richness and the abundance of Divine Blessing around you. You are truly home with your Beloved! But, as our dearest Archangel did say to you, you will need to walk now in the absolute highest integrity and truth, whatever your Truth is. Speak your Truth and live your Truth. You will need to be Awake and Aware and discerning, you will need to be open and loving and honest. For to accept the Rose of Light into your Spirit Sphere is to commit to a life Ethical Purity and Integrity, and anything that is not in the highest integrity for you will create instant discord and disharmony that can only be aligned by returning to that state of Grace and Love and Harmony that is the result of living in the Highest Integrity, Truth and Love. And so, we leave you with great Joy in our Hearts! You are Loved. You are Beautiful. You are Divine Light. You are the Sacred Rose ! 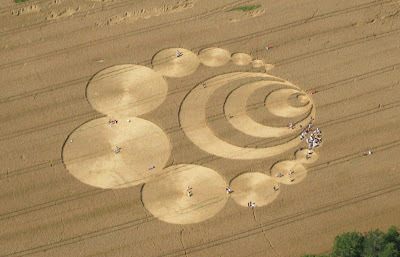 The Human Butterfly ~ Biggest Crop Circle Ever ! Amazing... the journey to here!